More than just a buzzword, Blockchain is the probable future of the digital supply chain. Blockchain’s biggest perk is its security. It can thus protect the IoT ecosystem, which is a complex network with innumerable devices connected to each other over the internet. These devices gather and transfer a bulk of information over a widely-spread range of sensors, machines, robots, and other such devices alongside the integrated systems. The data also needs to get through the administrative protocols, thereby posing a challenge to the ecosystem of IoT. Blockchain technology will allow these ecosystems to break from the predominant broker-based networking archetype, where devices simply depend upon a central cloud server to manage the individual devices. Let’s start by looking at the challenges that IoT and blockchain ecosystem participants must address. Operational challenges: A number of IoT and blockchain solutions exist in the market today; however, there is a lack of clarity in their business models. Whether the organizations will entirely redesign the business processes based on some common definitions of data; is also a big question. The interface of the atomic world and that of the bits is neglected, thereby allowing tampering of the devices by non-professionals. Supply Chain: Everyone loves progress, but nobody likes change.Corporate finance professionals might agree when it comes to the Internet of Things. While this much-vaunted technological trend promises new operational efficiencies and revenue opportunities, IoT also poses significant transitional challenges across legacy supply chain management, data systems and departments within many organizations. Managing those challenges poorly could lead to losses or lower returns. Technology: IoT solutions strongly require a scalable technology that is safe and foreseeable. These qualities are completely different on their own grounds. The security element comprises of the security of the device, the blockchain, and that of their interfaces. The other issues include exception handling, ensuring confidentiality, dealing with unconnected devices, and likely have a little system storage. Legal and Compliance: These issues can derail even the most promising project. For instance, no one takes up the responsibility of a device whose action was automatically executed by a blockchain-based program, triggered by another such program and brought out failure and damage or even financial loss. This led to the innovation of smart contracts, which were anyway far from being easy, even outside the IoT or blockchain context. First, the companies and organizations have to ensure privacy and confidentiality of the user data. Second, data communications should be protected at all levels. So, while building an IoT solution, the “right” data delivery including the right place, time, and form needs be taken care of. Third, all interactions should be tracked and monitored so that any suspicious activities can be instantly detected and rectified. Blockchain technology promises to be the missing link allowing peer-to-peer contractual behavior, without any third party to authorize the IoT transactions. It solves the issues of non-scalability, single point of failure, privacy, reliability, and trust in a congruous manner. This technology also provides a simple architecture for two or more devices to communicate or exchange information among one another. For message transfers, the IoT devices leverage Smart Contracts which can model the agreement between any two parties. This further enables the devices to function autonomously without the requirement of a centralized system. 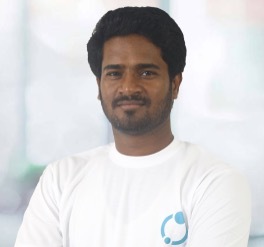 Quite affluently, Kumar T, the co-founder and CTO of DiscoveryIoT says, “Two of the biggest challenges faced by the IoT community are scalability of computing power, and cost of communication. With IoT potentially linking up millions of data sources (sensors, readers, scanners etc.) to the internet in an exponentially, the cost to process and store data increases in a fibonacci manner. This is where Edge Computing as a solution comes to the rescue, where each data source takes up bulk of the computing load as well, drastically reducing cloud computing power requirement. On communication costs, we believe the next generation of D-apps working on IoT will also have to consider ways to decentralize the communication between the IoT device and the blockchain architecture, thereby taking this cost to near-zero levels.” The decentralized model is easier to establish in any kind of industrial setup, where the IoT nodes can expand over widespread areas with short connectivity gears. Blockchain also makes possible the creation of secure mesh networks, where the IoT devices can reliably interconnect, keeping away the security threats of device spoofing or impersonation. Devices can easily identify and authenticate one another with the registration of legitimate nodes. This will cut down the need for central brokers, thereby, making the system more scalable. Forrester’s Martha Bennet confirmed that it’s time to start looking at the IoT and Blockchain convergence, even if the combination of both might not be for today. 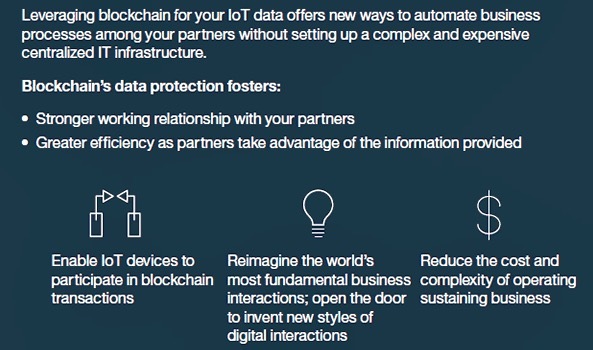 IoT data and the Blockchain could lead to intelligent automated insurance policy applications. The most significant one is the Smart Contract and the enhancement of several processes such as claims management. The convergence of these two technologies will move beyond the pure telematics model to the connection of real-time IoT information. The following IBM infographic clearly outlines the versatile uses of the convergence. DiscoveryIoT is an IoT-based supply chain startup which is successfully utilizing the blockchain technology for its applications. They plan to move their business cycle through two phases of operations; one of which is an IoT solutions provider, backed by a blockchain enabled network. The company is working towards familiarizing the industry with the disproportionate rewards that the inclusion of the Blockchain technology could bring in to any form of IoT solution. They are also solving supply chain issues by the consolidation of the Blockchain and IoT. The conjunction of the technologies of Blockchain and IoT has unlimited potential. IoT, as a technology, doesn’t stand on its own and requires to be analyzed in a broader context of enabling across various applications and industries. The additional technology of blockchain is required to improve the performance of IoT on the fronts of technology, data, and business, thereby broadening the picture. In the IoT world, the utilization of Blockchain is an emerging trend which promises to solve most of the security issues of IoT. The convergence of the two is, therefore, a boon.